What you’re looking at here is the most important Bentley on sale today. More than $1.2 billion has already been invested in product and facilities since 2014, the majority of which has been spent on the Bentayga. Over 1.6 million kilometres have been covered across five continents as well as an 83 degree-range of temperatures during Bentley’s most extensive testing and development program to-date. More than 500 customers have been interviewed, and intense market research has been conducted on an ever-popular luxury sport utility vehicle segment that will soon boast Maserati, Lamborghini and Rolls-Royce. Though the howls of discontent from purists have been rife since the EXP 9 F concept was revealed in 2012, production of Bentley’s first ever SUV was inevitable. The weighty door slams behind me with a reassuring thump, and inside lies traditional Bentley opulence, complete with a 130-hour build time. Every surface is of high-quality leather or wood, though the company draws our eye in particular towards the redesigned clock on the dash and the more minimalist control housing around the new, less chunky gear lever. At 1742mm, the Bentayga is not the tallest of SUVs but headroom is nevertheless ample. So too is legroom though rear space in the four-seater model may not be quite as generous as that of a Range Rover. What really impresses is the seating position, which is just about bang on for a sporting SUV: not too high but high enough, allowing the cabin to cosset around you. A dignified experience it is too, for save the muted rumble of the W12, there’s barely any noise in the cabin. Twin-scroll turbochargers align with 6-litres to produce 600bhp and 664lb ft of torque from 1350rpm. It catches not with a bevvy of rancorous revs but with a soft purr, which rather disappointingly continues even when in the higher revs. I had hoped we’d be treated to Bentley’s aggressive ‘woompf’, but no such luck. Smaller engines with hopefully throatier engine notes will follow, though how they will cope shifting that whopping 2440kg kerb weight remains to be seen. Make no mistake though, the W12, despite its rather muted soundtrack, is exceptional. Acceleration is incredibly vivid, a raw pick-up with no let-up until well into fourth gear. Bury the throttle into the pillowy soft carpet and the catch is immense, changes through the ZF eight-speed automatic mighty in both their speed and precision. 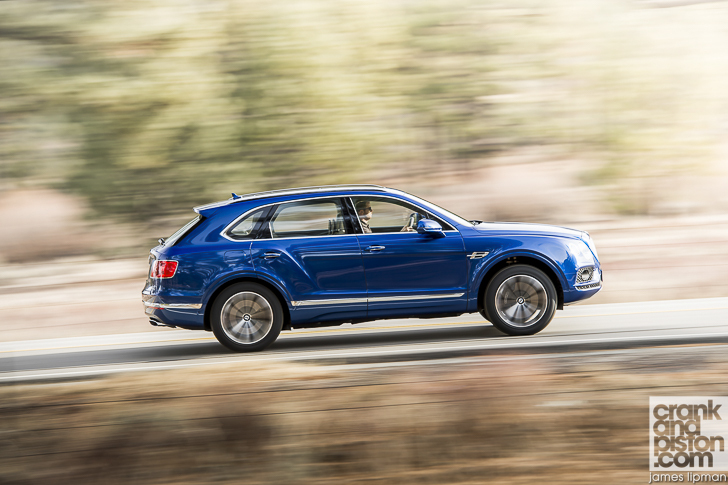 As such, 0-100kph is given a pasting in 4.1 seconds, the Bentayga capable of 301kph thereafter. At these speeds, it’s comforting that the cast-iron brake discs offer immense stopping power, although admittedly the more durable carbon-ceramic package will prove a relief when it arrives. The pedal can get a little spongy after some punishment. 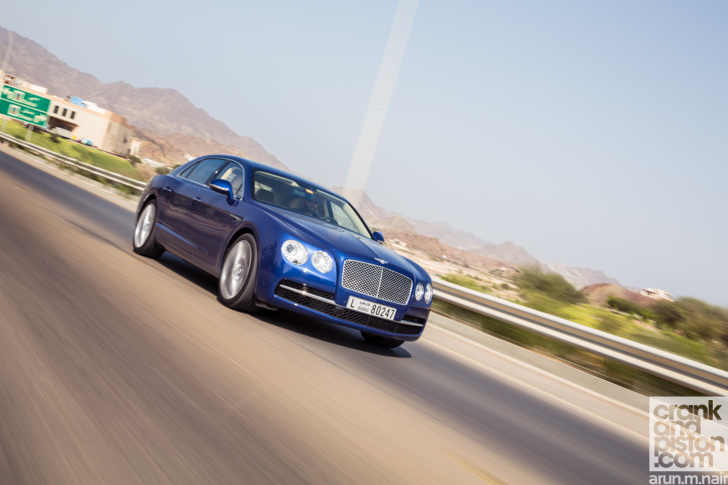 Road comfort meanwhile depends on your choice of driving mode: the default ‘Bentley’ mode for example – a blend of its extremes – doesn’t offer quite the superbly damped suppleness of Comfort, though the Sport-tight suspension arms do impress through the turns. On hard turn-in, I had expected the top-heavy list of most large SUVs as momentum shifts and the heightened centre of gravity takes over. Instead, there’s remarkably little roll and an impressive amount of composure. It’s not completely flat through the turns, but it’s enough to make me wonder how I’m managing to hustle a Bentley SUV. Still though it lacks the precision of a Porsche Cayenne (which it essentially is at the base). Consistent weighting in the electric steering from lock-to-lock offers reasonable amounts of feel, but more stability wouldn’t go amiss. And therein lies a key downfall for the Bentley. The poise under turn-in is incredible and the acceleration offers civilised aggression, but then lacks the urge to truly stand on everything and hustle the big Bentayga, even though you can. The cabin is too civilised, the ride too composed, the soundtrack too muted, the whole package too…grown up to offer a true thrill. It’s difficult not to be impressed though, particularly when we’re given a demonstration of its off-road prowess. The relevant driver assistance systems map throttle sensitivity, torque placement and gear change ferocity to produce truly excellent traction. Approach and departure angles can’t match Range Rover’s, though nobody at Bentley pretends the Bentayga is naturally at home on such surfaces. For a 2440kg SUV its sprightliness on the rough stuff is awe-inspiring, and proves far more capable than most owners will ever require. 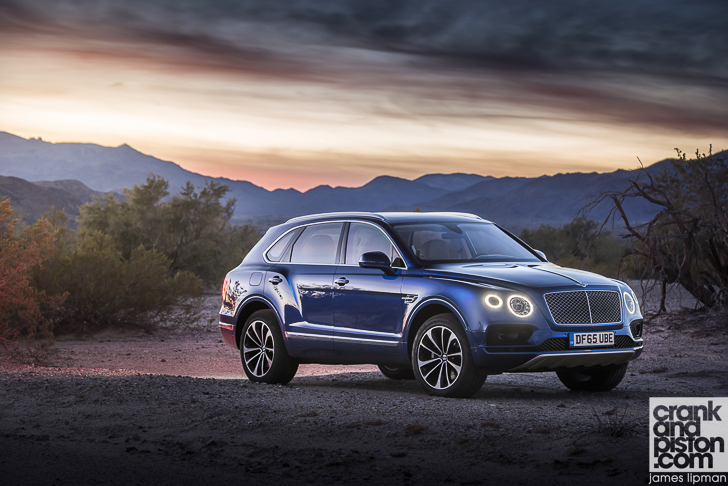 The strength and indeed the breadth of the Bentayga’s capabilities then is impressive. While at times the temptation is there – thanks to typically superb ride quality and impeccable build quality – to consider the Bentayga ‘just’ a big Bentley, there is indeed much more to it than that. In targeting neither the Cayenne nor Range Rover, visceral acceleration and superb handling mean the newboy is hardly embarrassed by its more exalted ‘opponents’. Again though we come back to the idea of engagement. I’m impressed by the stability and the biblical turns of speed, yet I’ve little urge to fully exploit them. Are there not other Bentleys with similar balance and character more capable of meeting this criteria? That may seem an unfair question, given the Bentayga’s more rounded capabilities, but still it’s a point that keeps nagging at me throughout the course of our drive. No matter though. Ultimately Bentley’s first crack of the SUV whip is a successful one, and there’s little doubt in my mind that those 5500 pre-orders will only be the start. 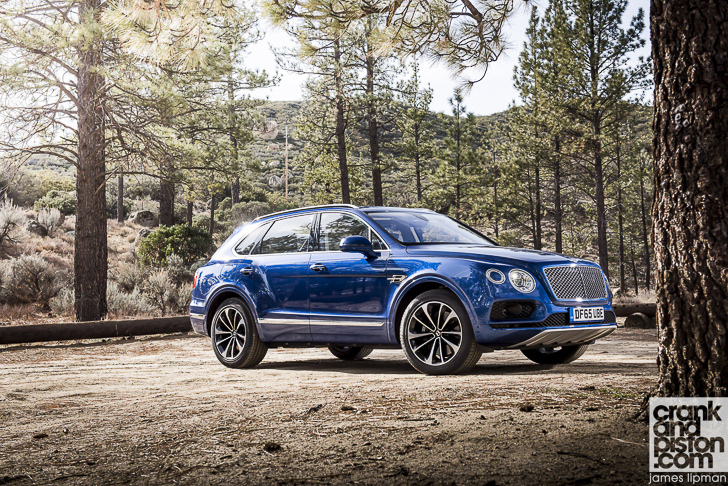 Did you enjoy our Bentley Bentayga review?